During the height of the globalization age in the late 1990’s, many leading Zeitgeist watchers were celebrating the rise of the “New Cosmopolitans,” a term coined by business reporter G. Pascal Zachary. A new civilization was being born out of the increasing flow of money, products, ideas, and most important, people, across the borders of decaying nation-states. In this post-modern globalized society, the new determinants for business, political and cultural success were national diversity and a “mongrel” sense of self, Zachary proposed in The Global Me: The New Cosmopolitan Edge, in which he challenged the central tenets of Samuel Huntington’s Clash-of-Civilizations paradigm. In his Global Me, Zachary provided the readers with a tour of the New, New Brave World and introduced us to fascinating characters, ranging from high-tech entrepreneurs to international aid workers, who posses the attractive mix of “roots” and “wings,” that is, hyper-mobile “global hybrids” with “transnational identities,” who won’t stay put in one place, who experience “the breakdown of the unitary self, the rising appetite for diversity, the growing taste for gumbo, the proliferation of voluntary attachments to places, practices and communities.” These individuals with roots in more than one nation and with wings to fly anywhere and anytime were “the fruits of the new patterns in migration and mobility,” Zachary wrote. “They are the future,” he concluded. 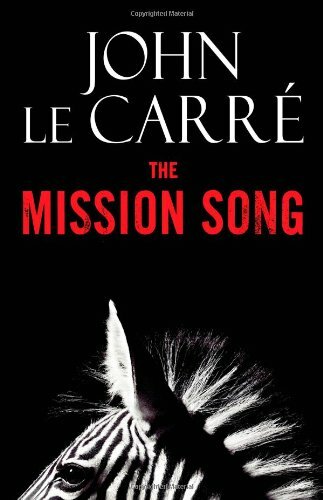 Bruno "Salvo" Salvador, the protagonist in John le Carré latest (20th) novel The Mission Song could have been one the “global hybrids” that Zachary celebrated in his travelogue. A 29-old idealistic interpreter (which is the ultimate “cosmopolitan” profession), he is a Congo native (born in the eastern part of the country) of mixed parentage, an orphaned love-child of an Irish Catholic missionary priest and a Congolese woman whom he never knew. Salvo attends a secret school where the sons of errant priests were sent for higher education and where he is mentored by the gay English Brother Michael and trained as an interpreter. He eventually becomes a British citizen and marries Penelope, an attractive upper-class white Englishwoman, who is a celebrity journalist whose female and male friends want to go to bed with her exotic husband. In addition to his fluency in English and French, Salvo also speaks Swahili and several other African languages such as Kinya-rwanda (the native tongue of Rwanda) and Shi (spoken in the eastern Congo). Of mixed race (he is nicknamed “Zebra”), very multilingual and embracing so many transnational identities, Le Carré’s fascinating character should serve as a clear demonstration that conflicting civilizations are not destined to clash but can actually co-exist in the persona of the New Cosmopolitan. With multiple roots and with wings that have helped carry him into top of Anglo-American and globalized society at the start of the twenty-first century, Bruno Salvador, Interpreter for Hire is in demand by a long list of employers, some of whom probably gather every year at the Davos, Switzerland: Executives of multinational corporations and government officials, shady lobbyists and shadowy spies, exile leaders and mercenaries, idealists and crooks. But instead of Davos, these characters are meeting in a mysterious island in the British channel, where the representatives of a multinational corporation (the “Syndicate)” with ties to Western governments, confer with two brutal Congolese warlords and the son of a corrupt Congolese businessman whom they try to persuade to sign a contract pledging support for the Syndicate's plan to install in the eastern Congo a government led by a charismatic and messianic figure called the Mwangaza. The Syndicate will be granted exclusive rights to the region's minerals and will ensure that its profits are equitably distributed to the people. Salvo is recruited act as simultaneous translator in the secret meeting and he is determined to play a constructive role in advancing a program that could help bring democracy, peace and prosperity to the eastern Congo, that part of the world where he was born and that is now stricken by repression, war, and poverty. As an interpreter, he expects to play the role of a cultural middleman between the progressive forces of globalization for whom he is working, investors and governments that supposedly want to develop and democratize Africa, and the leaders of the people to whom he is related through his mother and her tribal ancestors. As a cross-civilizational communicator, our global hybrid is certain that there is no conflict between the interests and values of the Brits and the Western powers that are sponsoring this conference and those of the representatives from Africa. And he will apply his professional, ethics and idealism to ensure that all the participants in the conference will be able to understand each other and that the final outcome will satisfy all sides and allow Salvo to continue maintain his role as the embodiment of the globalized society. But to his horror, Salvo discovers that the Syndicate and its Western supporters, including a gang of crooked investors and racist mercenaries are only interested in plundering Congo and its minerals. And with the assistance of power-hungry African tribal leaders who need the outsiders to provide them with weapons and funds to win control of eastern Congo they are planning a coup that will sink the country into another bloody civil war in which the members of his mother’s tribe will become the main losers. The process of globalization is now seen by Salvo not as part of a process of spreading freedom and prosperity worldwide but as way for shrewd political and economic players to advance their interests, and instead of serving as an agent of global progress, Salvo finds out that he is just another gun for hire. Hence it’s not surprising that Salvo experiences a rude and painful awakening that forces him to choose sides and him redefine his identity: the New Cosmopolitan starts reverts to his old national, ethnic, and tribal roots. He leaves his British wife after falling in love with Hannah, a young a patriotic Congolese woman who works as a nurse in London and who plans to return to Africa to raise her kid. He betrays his British employees and together with Hannah tries to disrupt the planned coup in Congo. And after his lover is deported and he is arrested and stripped of his British citizenship, he is day dreaming of going back to his Congo and to his Hannah. A global hybrid no more, Salvo wants to go home. In the Namesake,,Gogol Ganguli (played by Kal Penn), the American-born son of a couple that immigrated from India, Ashima (Tabu) and Ashoke Ganguli (Irfan Khan )Ganguli, cannot go home because he is not sure where home is. Is it in America, where Gogol is the embodiment of the -- yes, that cliche -- American Dream? Hence after growing up in the suburbs,he gets into Yale, becomes a successful architect in Manhattan, and is looking very smart in a Hugo Boss suit as he mingles with the In Crowd and is about to get married with a very white and very rich blonde WASP. Or is home in India -- his family, the tradition,the scenary, the food, the women -- to all of which he wants to return? But he cannot. He will always remain there in between: Unable to return to his roots and finding it more difficult to fly up, up and away. Indeed, like Moushumi, the daughter of Indian immigrant he falls in love with and marries (or perhaps he feels that he needs to marry her in order to make him mom happy), Gogol seems to be too globalized for his own good. In addition to the tensions between their American and Indian identities, Moushumi who studied in France,is an intellectual and a snob who seems to be alienated from the American culture, while Gogol who is named after the famous Russian writer is embarassed by his Russian-Indian name. The Namesake which was directed by Mira Nair and is based upon the novel The Namesake by Jhumpa Lahiri (which I didn't read), is too long and fails in getting its complex message across. Nair wanted us to associate India with the loving family and an old tradition, with warmth, sunny skies, laughter,real people, while America is supposed to feel so modern, loveless, cold, snowy, impersonal, phony. It doesn't work. In fact, I think that the old The Jazz Singer did a better job in capturing the immigrant experience and especially the tensions between the first and the second generations. But while The Namesake is more than a movie about immigrants, The Mission Song is more than a novel about Africa. In way, personal and intellectual journeys of both Gogol and Salvo represent a critical facet of the current globalization process. It suggests that while this political, economic, and cultural revolution can help make individuals more productive, more prosperous, more mobile, it cannot ensure that these individuals will abandon their old civilizational identities. In anything, the powerful encounter with the West, which is the main driving force behind globalization, challenges in a very painful way those who absorb the new ideas and who are in constant contact with and even migrate to the educational and business centers in North America and Western Europe. Instead of assimilating into the new global civilization, global hybrids like Gogol and Salvo or for that matter, the members of the Arab and Moslem communities in Europe end up feeling that they are under attack and want to return to their old roots and protect them. And if they try using their wings and fly, they sometimes can even crash into skyscrapers in Manhattan. I enjoyed your interview on antiwar radio. fine column...you could clearly do a china version...2025 when Sir John Templeton said China's GNP would pass US...the god of marketeers is growth.